Windowing – the process of managing the release sequence for content so as to maximise the returns from intellectual property rights (IPRs) – is changing because of transformations in the way that television is distributed and consumed. Drawing on original research into the experience of leading international television producers and distributors, this article breaks new ground by examining how rights owners are adjusting strategies for exploitation of the economic value in their content. Findings show how the rise of digital platforms and outlets whose footprints are diffuse and boundaries are porous is disrupting traditional windowing models. This has necessitated new thinking about how best to organize the sequential roll out of content so as to build audience demand, avoid overlaps and maximise returns. This article argues that changes in the dynamics of television distribution have altered not just processes for exploiting the value in IPRs but also content and content production, with implications for audiences as well as industry. 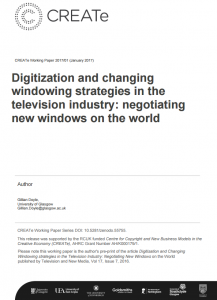 Download Digitization and changing windowing strategies in the television industry: negotiating new windows on the world.